There must still be a good month left to summer, but I’m already beginning to mourn the loss. I love fall; I mean, really love fall, but since moving to Nebraska I’ve come to love summer almost as much. Growing up in Southern California, you’d think I’d be a die-hard when it comes to summer, but that just hasn’t always been the case. In fact, as a Californian, I dreaded summer. I didn’t even like spring because it meant summer was coming. For me, summer in Southern California meant smog, brown hills, and unrelenting heat. When we left Southern California for the Central Coast, we traded heat and smog for fog, which was an improvement, but still not enough to overcome my dislike of the season. One of the biggest surprises of our move to the Midwest is that I have fallen in love with summer. Granted, we live in a wooded area near the river, but I’ve never seen such summer beauty. 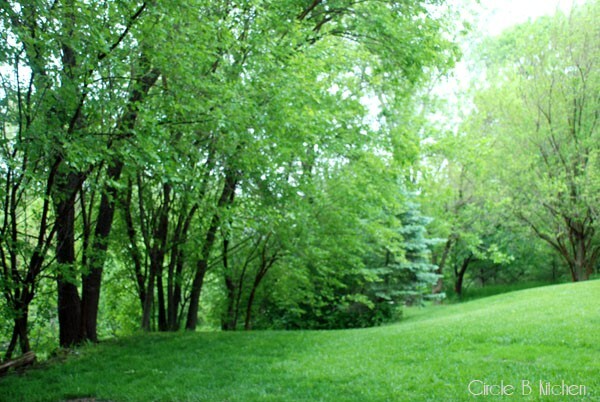 The lush, impossibly green, almost tropical landscape of the trees and grasses, the summer thunderstorms (which I love), and of course, the fireflies, all make summer a magical time here. And then there are the tomatoes. I have two gardens and no less than 20 tomato plants between the two of them. So, as if it’s not bad enough to be anticipating the loss of our lush green foliage and magical summer evenings, I am beginning to imagine the day is coming that I will not be able to pick a ripe, juicy tomato, slice it up and slap it on some fresh bread for my lunch. But for the time being, I still have an abundance of tomatoes, and this tomato tart is one of the best ways I know to show them off. This is so good, people. I got the recipe from the San Francisco Chronicle (yes, I’m still attached), and it’s a good one, although I admit I really did make quite a few substitutions. a mixture of fresh ricotta (I had just made a batch) and goat cheese for the fromage blanc, and sliced shallots for the red onion. And I will tell you that this beautiful tart forgave me for these omissions (and that I took the photo before sprinkling it with the fresh basil), and it turned out incredibly delicious in spite of them. In fact, The Husband was completely taken by the combination of pastry crust, cheese and tomatoes, and so if you, too, are out of puff pastry, this is an honorable stand-in. And the combination of fresh ricotta and creamy goat cheese is a must. I made a few substitutions with this recipe as follows... I didn't have puff pastry on hand so just made a pie crust pastry (You could use a store-bought pie crust for this, but I'm sure the puff pastry would be great too); I substituted fresh ricotta mixed with goat cheese for the fromage blanc; I left off the olives and substituted sliced shallots for the red onion. I also made only 1 tart, so I just halved all of the ingredients. This is great for dinner with a salad, but you could cut it into smaller, even bite-size portions for an appetizer. The tart will hold in the refrigerator for several days. Reheat in a 400-degree oven for 10 to 15 minutes to re-crisp the crust. Makes 2 tarts. One tart will feed 4 to 6 as a main course and several more as an appetizer. INSTRUCTIONS: Preheat the oven to 400 degrees. Line a large baking sheet (or 2 smaller ones) with parchment paper. 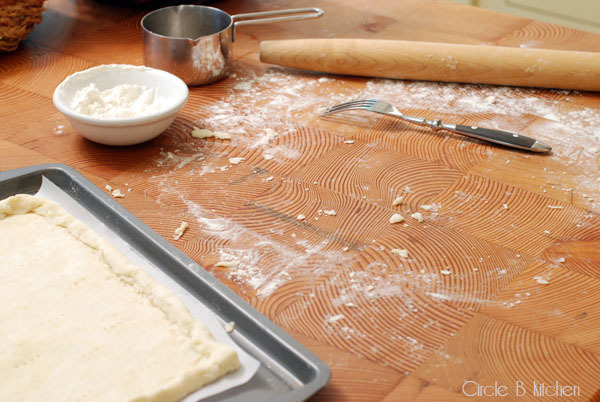 Roll out each puff pastry sheet to a 12 x 14-inch rectangle. 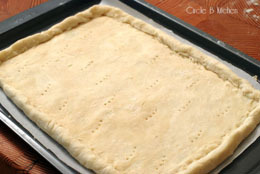 Place on the baking sheet and fold over the edges of each pastry to form a 1/2-inch border. Prick the bottom of each pastry with a fork and bake for 10 minutes. Let cool for 15 to 20 minutes. Meanwhile, slice the tomatoes in half widthwise and gently squeeze out the seeds and juice. Slice the tomatoes into 1/8-inch-thick rounds. Using a rubber spatula, spread half of the fromage blanc over one of the cooled crusts. Cover the fromage blanc with half of the tomatoes, slices overlapping, then season with salt. Top the tomatoes with half of the onion slices, dot with half of the olives and sprinkle with half of the thyme and some pepper. 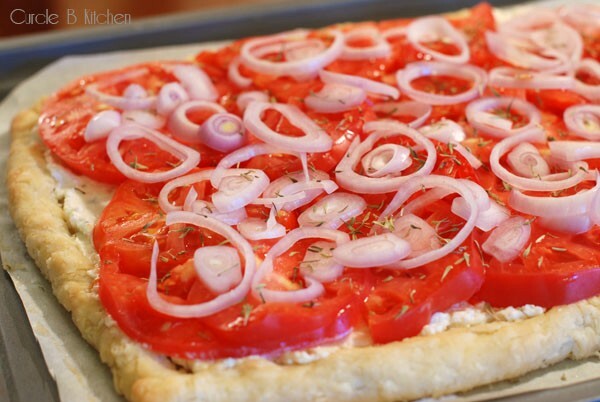 Bake the tart for 18 minutes, or until the tomatoes are very soft but before the onion gets too brown. Just before serving, drizzle the tarts with the olive oil and sprinkle with basil. * Substitutions or alterations as noted in the top paragraph.